A disappointing weekend for the No. 2 Boston University men’s hockey team ended in crushing fashion on Saturday night, as the Terriers (2-2) fell 3-0 to Minnesota State University. The loss concluded a two-game sweep at the hands of the Mavericks (2-1), who entered Agganis Arena following a 4-0 shellacking at the hands of St. Cloud State University in their season opener. Even though BU outshot Minnesota State in the first period, the Mavericks rebounded nicely and finished off the game by outshooting the Terriers 28-26. In the first period, BU was the enforcer, releasing 24 shots compared to Minnesota State’s 11. In the final two periods, the script was flipped as the Mavericks shot 42 times compared to just 22 from the Terriers. The primary reason why Minnesota State was able to stay within fighting position while being forced on their heels throughout the first period was the play of goaltender Jason Pawloski. Pawloski was lights out on Saturday night. He pitched a shutout against a formidable Terriers offense, saving 26 shots in 60 minutes for his first win of 2017-18. Pawloski stopped 12 shots in the first period and 10 in the third period to stave off a BU comeback. His counterpart, sophomore goaltender Jake Oettinger still managed to save 25 shots of his own. However, Oettinger allowed two goals to skip by him to finish up the weekend. The Mavericks were also stifling defensively. Using their physicality and veteran savviness, Minnesota State crowded the net defensively, blocking 14 shots. 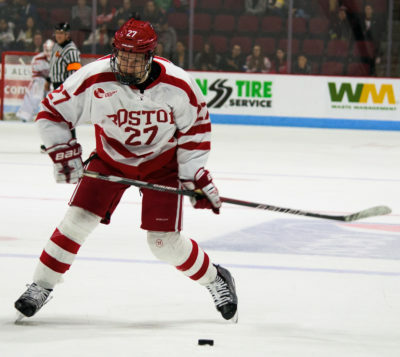 Pawloski was assisted on a plethora of occasions by his defense, which was willing to place their bodies on the line to prevent rips from the Terriers from reaching the goal. Minnesota State also forced the issue on the Terriers in the loose puck battle. The Mavericks were aggressive when it came to stray pucks on the side boards and in the offensive zone. One of these loose pucks concluded in a crucial tally for senior forward C.J. Suess 13:56 into the second period. After Oettinger stopped a shot on goal by senior forward Zeb Knutson, the rebound floated into the middle of BU’s defensive zone. Suess won the race to the puck and flipped it past Oettinger to provide his team with some much needed insurance. However, the Terriers efforts on Saturday resembled the hard-ironed identity that the team is attempting to form, more so than in their 6-3 loss to the Mavericks on Friday night.